This journal appears to be a unique record of daily on site observations and construction processes of the building of a second Harlem River bridge at the site of Third Avenue, County of New York (Manhattan). It contains copied documents such as the New York State Legislature’s document Chapter 774 dated April 17, 1857 authorizing the building of a new bridge at the site, as well as the design requirements for the new bridge, removal of the previous bridge and the official appointment and acceptance letters of the chief engineer, William J. McAlpine and assistant engineer, Frederick Hubbard. This information is copied into the first numbered pages of the bound journal. The journal appears to be written for the purpose of having a record of all various loose documents relating to the project. 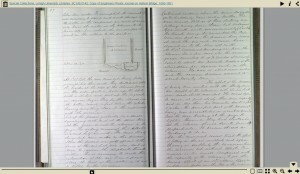 There appears to be at least two different styles of handwriting: the earlier entries are written in an elegant careful style possibly by the assistant engineer; the last few weeks of entries are in a hurried, abbreviated scrawl with pages left blank seemingly left open to be filled in when the loose documents became available to be transcribed into the daily working account. Evidence of this manner of copying documents and notes into the bound journal consist of a few pages written on loose sheets laid in the area of blank pages bearing the same dates. The journal not only has written text but contains many detailed construction drawings (on different paper) fastened into the bound pages, as well as lists and tables of materials, costs, working hours and weather conditions.